Our largest ever cohort of Year 13 students at Harrogate Grammar school are celebrating an excellent set of A Level & BTEC results today. These results continue the impressive performance of HGS Sixth Formers in recent years and provides a springboard for an extremely wide range of higher education, apprenticeship and employment opportunities. 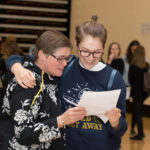 Despite significant national changes to the A level Examination system, with almost all subjects now fully linear, our largest ever cohort of Year 13 students at Harrogate Grammar School Sixth Form have achieved exceptional results with 60% of all A Level grades being at A*-B. 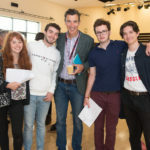 This demonstrates an outstanding performance from a Sixth Form which prides itself on its inclusivity and comprehensive intake, with 93% of all exam entries achieved at A*-D. In addition, an impressive 30% of grades were A*-A and 9% at the top grade of A*. The outcomes for our BTEC courses are equally notable with 88% of all results achieving the highest level of Distinction* or Distinction. This shows Harrogate Grammar School’s continued commitment to world class provision and to enhancing opportunities for all. Our students have yet again made progress beyond national expectations. HGS students continue to be accepted into the country’s most competitive universities. Jacob Dale (A*A*A*A*), Izzy Wood (A*A*A*) and Lucy Pilling (A*AA) will be studying at Cambridge University. In addition the following students achieved 3 A* grades and 1 A; Phoebe Hodgson, George Kendall and Mabel Calvert. Similarly impressive with 2 A* grades and 2 A grades were Ellen Young, Jim Troy and Eve Long. Anna Brittain achieved 2 A* grades, 1 A and a Distinction* in music. There was quadruple success for two sets of twins. Astrid and Isobel Walker totalled 4 A, 1 Distinction* and 1 B grade between them and Amy and Jasmine Warriner achieved 2 A grades and 4 B grades between them. Students are heading off to a wide range of destinations. 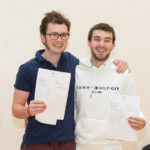 Alfie Richards, who is currently rehearsing with the National Youth Music Theatre in London, has been accepted at Rose Bruford College of Theatre and Performance in London and Josh Collins is heading to the Guildhall School of Speech and Drama to study technical theatre. Other students are taking a gap year, for example Chloe Simmons will be doing volunteer work for ‘Project Trust’ teaching English to children in Thailand. A number of apprenticeships have also been secured. This is just a sample of the range of excellent results and progression routes, which recognise the exceptional hard work of all our students, the support of their families and the dedication of all of our teachers and support staff. Our students and staff have responded superbly to the significant challenges brought about by curriculum reform and it is with great pride that Harrogate Grammar School would like to congratulate all our students and wish them every success in their future endeavours.